With the most recent snow storm this past week (and two snow days! ), I pushed my kids out the door to go play in the snow with our neighbors. After their initial grumbles as they pulled on their snow pants, they rolled out the door, and into 18" of fresh perfect-for-snowballs-and-snowmen-and-snow-forts snow. My kids and the neighbors immediately settled in to their usual snow fort building groups -- boys vs. girls. The hours of driveway shoveling we had done the day before had created the perfect scenario for this skirmish -- a huge pile of snow on each side of the driveway. The boys chose the right side. The girls chose the left. The girls decided that their fort would be an ice cream shop. They served fresh snow cones in various sizes: small in badminton birdies, medium in plastic cups, and large in plastic traffic cones. They were sure to collect the snow from a "fresh" area of snow, digging down about 3 inches to be sure the snow was clean. Fortunately for the boys, the cost of the snow cones was one tree branch each, so they each ordered their own. Watching the kids make their forts always makes me reflect on the snow structures my sister and I built as kids. Since there were just the two of us, and we weren't much into snowball fights, we went more of the igloo route. We'd spend hours perfecting our igloo, and were usually able to get it to be big enough to fit both of us and our dog inside! 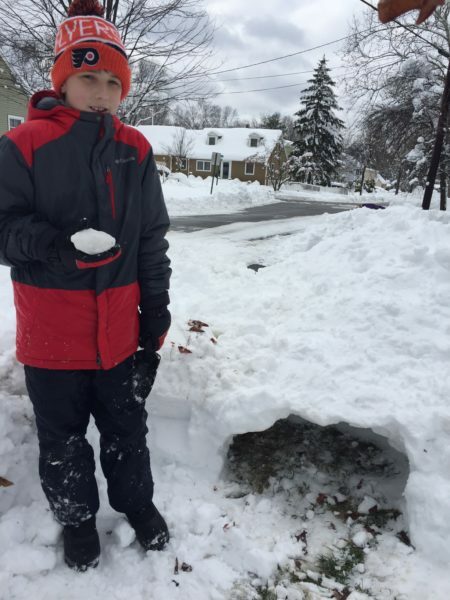 It makes me smile to know my kids can enjoy the same simple pleasures of building snow forts as we did.